Babylon Translator for Windows Phone is a Windows Phone App from Babylon Ltd that performs the text translation between languages . Currently . the App supports more than 75 languages and also provides definitions for the terms in the selected language. Babylon is one of the world’s leading provider of dictionary and translation software . 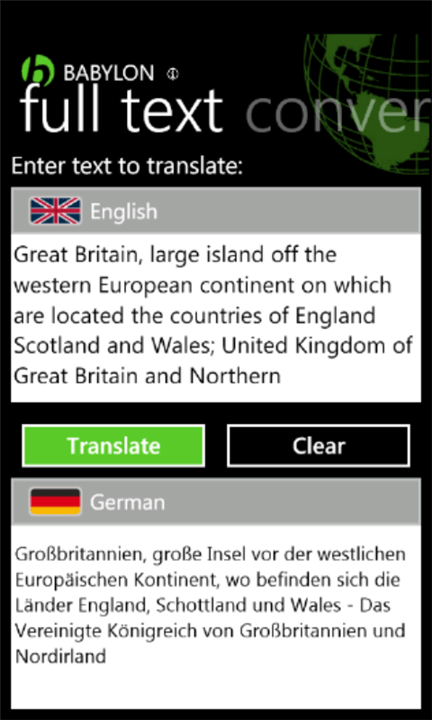 Babylon Translator for Windows Phone includes Menu for translating individual words and sentences ,Translating individual words with their definition in the selected language .